This is a very special draw this week and I wasn’t sure what to do…but the card gave me the answer. This last week our dear friend Ryoichi, contributor to the Voice of the Soul cards, left his body and went to a place of pure positive energy. A great personal loss for me, and I didn’t know what to do about the card this week. I thought it would be great just to post the Puppy card, as of the four he illustrated, that was the most fun and the last one he completed. So this morning I just took a deep breath, shuffled the deck several times…and drew the Puppy card. Whew…what can I say. Ryoichi especially loved dogs and had talked about getting one recently. 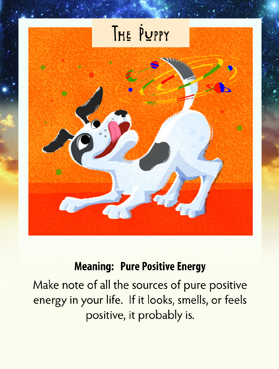 Now he IS the pure positive energy that the Puppy card represents. That is one heck of a creative transformation! He was so much more powerful than he appeared. He will be very dearly missed. But please look at the energy of the card he created and think of that this week. And think of Ryo, wagging his tale, creating a new universe. Ah, it is such a cute card and extremely full of positive energy. Thanks! This image is certainly Ryo’s Higher Self- this is who he really is! Thank you so much for sharing this image.